The married men crew return in Carl’s new January 2017 release, Man on the Run. 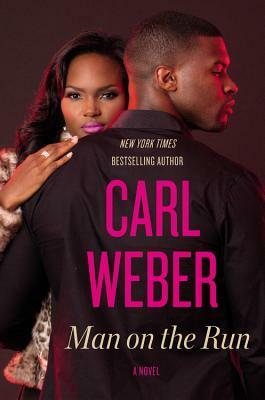 If you’ve read any Carl Weber books, then you know he brings it each and every time! I must say that this book is long overdue! If you have not read Married Men and She Ain’t the One, I recommend that you read those before reading Man on the Run. Those two books provide background information I think is needed for readers to completely understand fully the relationship between the four friends. I do think Man on the Run can be read as a stand alone, but seriously, don’t do that to yourself. Read those two books first if you have not. The quick rundown: After spending 10 years in prison, Jay Crawford escapes. He is determined to prove his innocence, although his escape doesn’t come without interfering with the lives of his best friends, Kyle, Allen, and Wil. Can Jay stay free with the marshalls on his back while trying to clear his name? Will the crew survive after all of the madness surrounding Jay’s escape? It had been a while since I’ve read a book that I could not put down. I was reading this on the Kindle, became all cross-eyed and was tired, but I was determined to keep reading because it was just sooo good. I had to force myself to put the Kindle down and go to bed. Reading about these guys again was like a reunion. A sweet, long overdue reunion. Oh, and I must add here, that if you’ve read the Family Business novels, then you know that Wil is a Duncan. Put those pieces together, will ya! So yes, there are some endings, some beginnings, and overall just some great writing and storytelling. In short, Carl always delivers. Every single time. He just can’t get it wrong! Although some parts of the book was predictable, it was highly enjoyable. Check it out! You won’t be disappointed. I received an advanced digital copy from NetGalley for my review.